Another great night of racing at delta! Perfect weather, done racing early, super bright lights and a cool group of racers. Quite a few new racers showed as well. Thanks Ken johns for all the prep work on the track and Kraig for the gift card to the store! They handed out store credit to the winners in the two largest classes. Very cool! See ya guys at the explosion race Gonna be a good one for sure. I will be there racing whatever classes offered haha lets get going. The track is awesome right now low tire wear last few times out. Kraig has been lightly watering between rounds. Offroad roll cal for saturday night! Who's In?? 4wd Sc, 2wd Sc maybe some 4wd buggy! Both. Track will be prepped with sugar to try and make it hold together and watered as needed. It should be different than our 1/10 track since the dirt is different and has not been sugared much at all. The new 1/8 scale track... BRAVO! BRAVISSIMO! 4th year of our Short Course Explosion race! Come on out to Delta RC for a great day of offroad racing! This year we will be racing on our larger "1/8th" track. Fresh 100% new layout that should provide a ton of airtime and fun! Race will be on Saturday September 28th. Gates will open @ 10 and racing starts @2pm. 2 round of quals followed by a raffle, the Delta Derby, and then the Main events. Entry fees are 25/15/10. Awards to top 3 in each class!!! For those who may have missed the "Delta Derby" the past few years, it is an absolute blast! Here is how it works. You have 20 drivers(10, 2 person teams) racing at the same time. Entry fee is $5 per driver. No corner marshals. Race for 5 minutes. Add each teams laps together. The team with most laps in 5 minutes takes home $100 CASH! Vid from a couple years ago! What time do gates open to the off-road/oval track tomorrow? Any new off road race results posting soon? 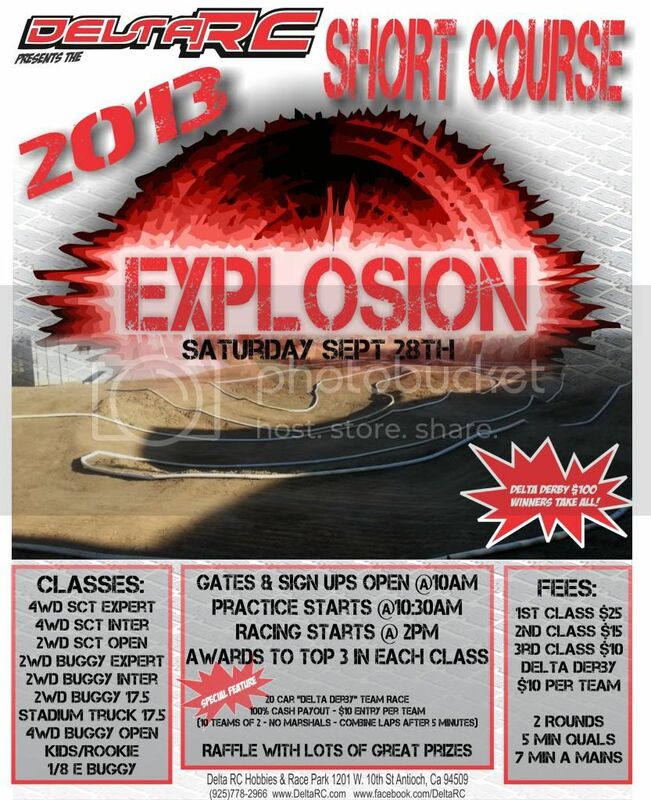 4th Annual SHORT COURSE EXPLOSION race will be Saturday September 28th!!! More info coming soon! Offroad side closed on monday. New shop/onroad track is open monday. Both open regular business hours on Sunday. Hopper, does that mean the track will be open for practive on Monday? Also, is the track open Sunday? Septermeber events have not been published yet for DRC. Delta Rc will be having our Labor Day Sales event this weekend Fri thru Monday! All regularly priced, in stock items will be 10% off! Thanks for your support!